The Device Manager is available as a separate tool in Adaptive Vision Library SDK. Typical state of the Device Manager is shown on image below. Note that the window may change its appearance depending on its purpose (like selecting a device address in a filter). At first the manager will search local network for active devices. 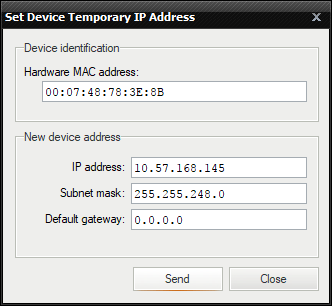 All found devices will be shown in list with the following information: manufacturer name and device name, current IP address, network interface hardware address (MAC address), serial number (if supported), user specified name (saved in the device memory; if supported by device). Informations like MAC address and serial number should be printed on the device casing for easy identification. Sometimes, when a device has more than one interface, is may appear in list more that once. In this situation every entry in the list identifies another device feature. Refresh button performs a new search in the network. Use this function when the network configuration has been changed, a new device has been plugged in or when your device has not been found at startup. Tools button opens a menu with functions designed for device configuration. Some of these functions are device dependant and require the user to selected a device on the list first (they are also available in a device context menu). This tool allows to access device-specific parameters prepared by its manufacturer and available through GenICam interface. This tool is intended to manage network configuration of a device network adapter. Static address — this field allows to set a static (persistent) network configuration saved in device non-volatile memory. Use this setting when the device is identified by IP address that cannot change or when automatic address configuration is not available. This field has no effect when Use static IP field is not checked. 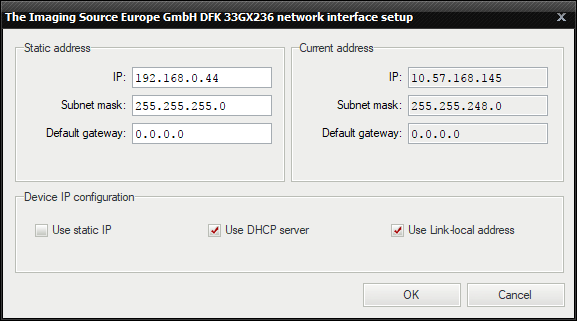 Current address — this read-only field shows current network configuration of a device, for example the address assigned to it by a DHCP server. Device IP configuration — this field allows to activate or deactivate specified methods of acquiring addresses by a device on startup. Some of this options can be not available (grayed) when the device is not supporting specified mode. Use static IP — Device will use address specified in Static address field. Use DHCP server — When a DHCP server is available in the network, devices will acquire automatically assigned address from it. Use Link-local address — When there is no other method available a device will try to find a free address from 169.254.-.- range. When using this method (for example on a direct connection between the device and a computer) the device will take significantly more time to become available in network after startup. After clicking OK the new configuration will be send to a device. Configuration can be changed only when the device is not used by another application and/or is not streaming video. New configuration may be not available until the device is restarted or reconnected. This tool is intended for situations when a device cannot be accessed because of its invalid or unspecified network configuration (note that this should be a very rare case and usually the device should appear in list). The tool allows to immediately change network address of an idle device (thus realizing GigE Vision® FORCE IP function). This tool requires a user to specify device hardware network adapter MAC address (should be printed on device casing). After that a new IP configuration can be specified. The address can be changed only when the device is idle (is not connected to other application and not streaming video). The new address will be available immediately after successful send operation. This tool allows to access and edit application settings related with driver transport layer, like connection attempts and timeouts. Settings are saved and used at whole application level. Changes affects only newly opened connections. Changes made in Device Manager application does not affect applications based on Adaptive Vision Library. Application must set up its transport layer configuration individually (see GigEVision_OpenSystemConfiguration). GigE Vision® devices are implementing GenICam standard. GenICam standard requires that a device must be described by a special XML file that defines all device parameters and capabilities. This file is usually obtained automatically by the application from the device memory or from manufacturer's internet web page. Sometimes the XML file can be supplied by manufacturer on a separate disk. Adaptive Vision Studio and Adaptive Vision Executor use a special directory for these files which is located in the user data directory. Use this tool to open that directory. Device description files should be copied into this directory without changing their name, extension and content. File can also be supplied as a ZIP archive — do not decompress such file nor change its extension.